The hydrogenation of mono or dihydroxynaphthalenes related to the position of hydroxyl groups was compared by terms of the reaction rate and the relative concentration of desired decalols resp. 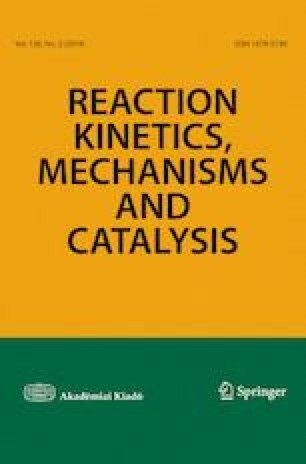 decalindiols in the reaction mixture under chosen reaction conditions (170 °C, 14 MPa) and using Ra–Ni catalyst with Cr promotor or 5% Ru/C catalyst. The amount of undesired hydrogenolytic products increased in the rows 2- < 1-naphthol and 1,8- < 2,7- < 2,6- < 1,5-dihydroxynaphthalene. The selective formation of decalin-1,5-diol in the concentration higher than 1% at the total conversion was not observed. Under suitable reaction conditions at the total conversion of starting substituted naphthalene, the highest achieved relative concentration of decalin-1,8-diol approximately 69% and 89% using Ru/C catalyst (Ru paste type 605) and Ra–Ni Acticat 1600 catalysts was achieved. This work was realized within the Operational Programme Prague—Competitiveness (CZ.2.16/3.1.00/24501) and “National Program of Sustainability” (NPU I LO1613) MSMT-43760/2015.